Compete in one of the most beautiful & pristine event venues in the world! 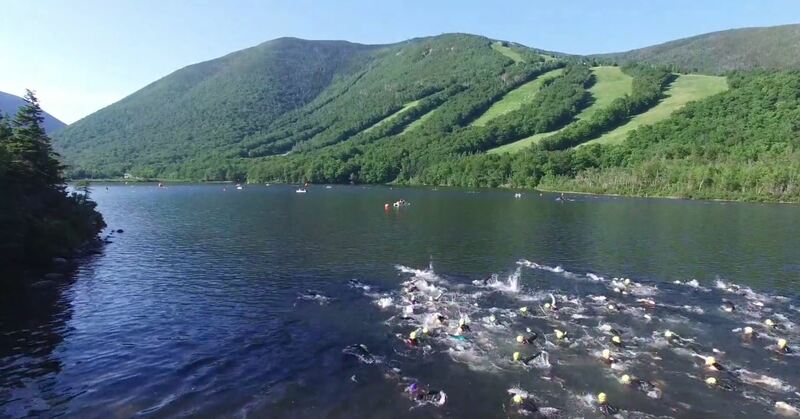 Tri to find a better view than this picturesque and challenging course through NH’s breathtaking White Mountains National Forest! All participants will have the chance to earn their custom finisher’s medal at the finish line! With a unique pre-race summit social on top of Cannon Mountain and a post race slope side BBQ this race has it all! 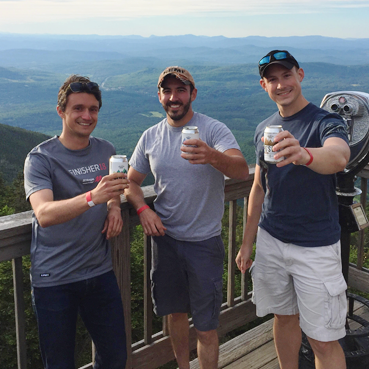 5:30pm-7:30pm – Summit Social: Attendees will take the Cannon Mt Aerial Tramway to the summit of Cannon Mountain and be treated to a beer from Woodstock Brewery, race friendly appetizers, nutrition sampling from our friends at UnTapped, and of course a beautiful sunset across the White Mountains. – We’re excited to host 4x Nordic Skiing Olympian Kris Freeman at the Summit Social! 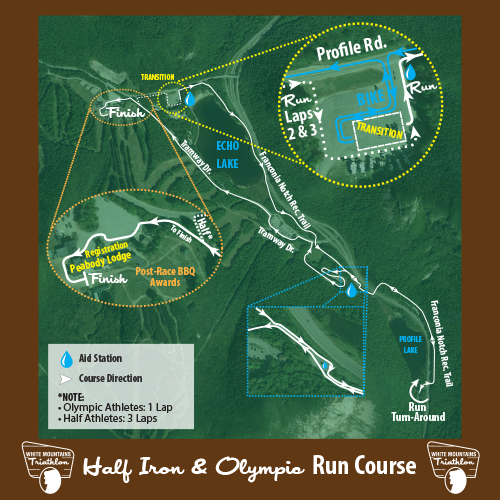 5:30am-9:30am – Race Day Packet Pick-Up & Registration at Peabody Lodge, Cannon Mt. 6:45am – Mandatory Race Meeting at beach for ALL Half-Iron athletes on the beach. 8:15am- Mandatory Race Meeting at beach for ALL Olympic athletes on the beach. 10:00am – Mandatory Race Meeting at beach for ALL Sprint athletes on the beach. 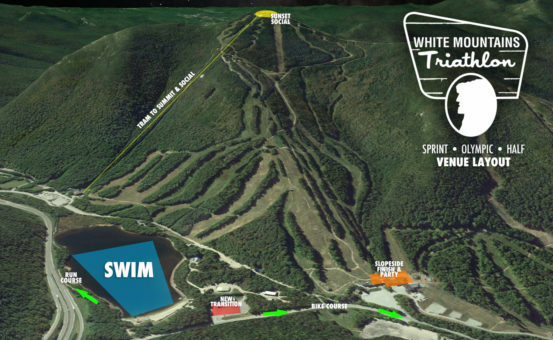 Cannon Mountain and Franconia State Park plays host to the White Mountains Triathlon. 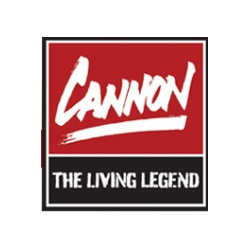 Friday’s early bib pick up is at the base of Cannon Mt. at the Aerial Tram House. Friday evening’s Summit Social is at the top of Cannon Mountain and is accessed via the Aerial Tram. 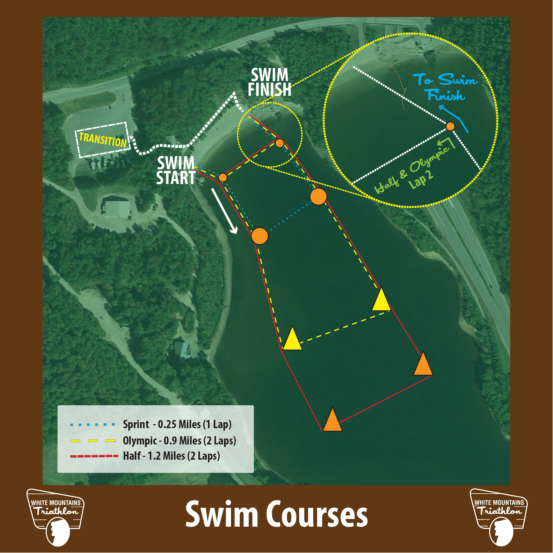 The pristine Echo Lake is the swim venue, Transition is in the Echo Lake parking lot and the finish is slope side at Cannon’s Peabody Lodge. Parking is conveniently located in the main Cannon Mountain Parking area. Sprint (7.25 mi): The Sprint ride of the begins with a quick descent of along Rt. 18 until a sharp right turn takes you onto Rt. 141. This is where the course starts climbing until riders cross under I-93 after a 1.5 mile climb. Riders will take a right on Rt. 3 and continue on the paved bike path as a preview of the final 2 miles for Sunday’s races. 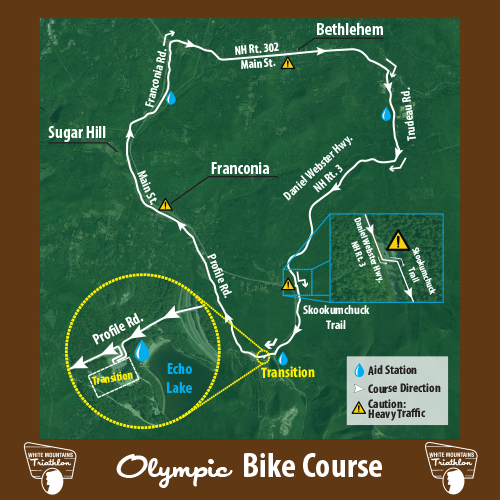 Olympic (40k): The Olympic ride begins with a 3 mile descent of 10% along Rt. 18 all the way in to and through Franconia Village. Turning into Bethlehem on Rt. 302, you’re in for an awesome section through the beautiful White Mountains. A turn onto Rt. 3 brings you back to Cannon and the transition area via a beautiful, paved bike path for the final 2 miles. Half (56 miles): The Half ride begins with a 3 mile descent of 10%. It remains along Rt. 18 all the way in to Franconia Village prior to turning on scenic Rt. 116. While challenging, this part the route along side Lost River is where our famous “King of the Mountains” challenge awaits. 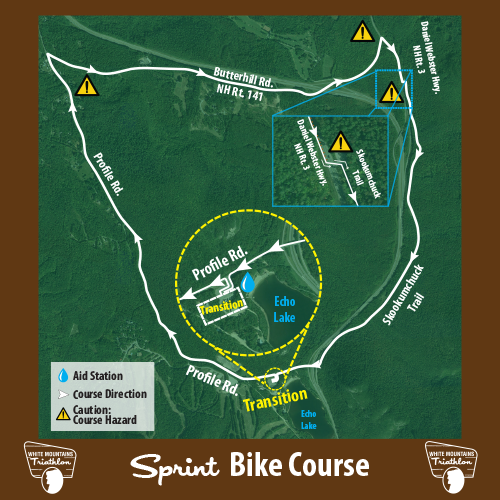 Riders will turn around at the Beaver Pond rec area and head back into town. You’ll continue through the pristine White Mountains, turning onto Rt. 18 and continuing onto Rt. 302 into the town of Bethlehem. A turn onto Rt. 3 brings you back to Cannon and the transition area via a beautiful, paved bike path for the final 2 miles. First 3 tiers filled! Only tier 4 remains before SELL OUT! Tier 1: First 25 registrants | Tier 2 : Next 75 registrants | Tier 3 pricing: Next 125 registrants | Tier 4 pricing: All remaining online registrants until SELL OUT! Packet Pick-Up: Available Friday evening and on race morning. Please refer to the athlete guide and schedule for times and locations. To pick up your packet, per USAT guidelines you must present a picture ID, and if a USAT Annual Member, your membership card. Packets may not be picked up for any other competitor, and may be claimed by the athlete only. Relay Team Packets: All relay team materials will be included in ONE team packet. The packet may be picked up by any team member, provided they have Photo ID. 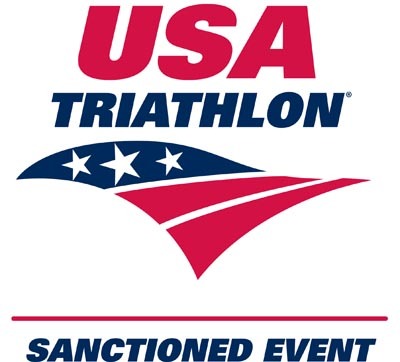 USAT Membership: This is a USAT (USA Triathlon) sanctioned event, thus requiring every participant to hold either an annual membership or a one day USAT license. Athletes who cannot provide proof of active annual membership will be required to purchase a one day license. USAT State Championship: We’re proud to host the 2019 USAT New Hampshire State Championships for both Age Group competitors and High School athletes! The top 3 adult age group and High School finishers for each gender will be recognized by USA Triathlon. Transition Area: Opens at 5:30 am on race morning, and will close 20 minutes prior to the start of each respective race. Bike frame number must be applied to enter the TA. Transition will open for athletes to collect gear and bicycles after the last athlete has finished the bike portion of each event. Pets – Can I bring my furry friend? : While we are animal lovers, pets are not allowed in Franconia Notch State Park or at the White Mountains Triathlon for safety reasons. Competition Category: As a USAT sanctioned event, results will be submitted to USA Triathlon and all individual finishers will be ranked within their competition category nationally. All individual athletes will be required to chose one of the following categories to compete within. Swim waves will be compiled from category so that like category athletes compete directly with one another. Athletes who change swim wave will have their competition category updated accordingly. Age Group – All athletes wishing to race against their same-age and gender participants. This category will make up the bulk of participants. Novice – For athletes more comfortable starting in the final swim wave. Novice athletes are not eligible for age group awards. Wetsuits: Water temperature is typically in the low 60’s in June, wetsuits are MANDATORY for all races. Wetsuits may be full length or sleeveless. Bike Support: Our friends at Littleton Bike & Fitness will be at transition to help with any prep work, but you’ll need to be prepared and equipped to deal with flats as there will not be bike course support en route. Bike Rentals: From out of town and in need of a quick bike rental? Our friends at Littleton Bike & Fitness have you covered! They’re located just 15 minutes from the race venue. Bike Aid Stations: Two aid stations with Gatorade and water bottle exchange will be strategically sited on the bike course. 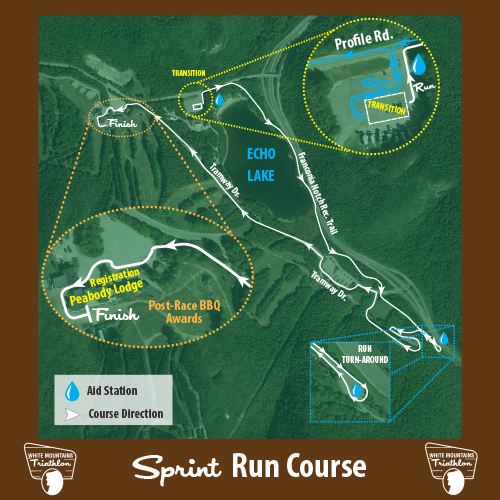 Run Aid Stations: Aid stations will be provided with Gatorade, water, UnTapped energy gel, and bananas on the run course. Course Cut-Off Times: It’s our desire to permit adequate time for triathletes to finish our race. That said, while we haven’t imposed a hard and fast cut-off policy, we expect to look to see where, and how many folks are on the half iron distance bike course by 11:45AM. 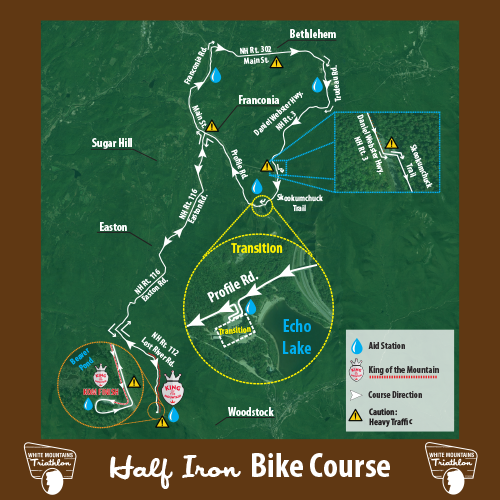 With a 7:00-7:15 swim start window for half iron athletes, 4.5 hours is sufficient for all bikers to ride the 56 miles, that’s a 12.4mph average. Finish Area: The finish venue is slope side of the Peabody Lodge, adjacent to the lodge deck! The backdrop for finish line photos is awesome and post race festivities with food will take place alongside the finish, so there will be plenty of action and a great environment. Post-Race Food: The post-race BBQ is slated to be underway by 11:00AM. Athletes will be admitted with their “Food” tear off tag from their bib number. Additional tickets for friends and family will be available for sale ($10) during online registration and on-site. Additional food tickets purchased during registration will be included in athlete packets. 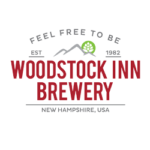 Post-Race Beer: Enjoy a post-race beer provided by our friends at Woodstock Inn & Brewery at the Peabody Lodge . 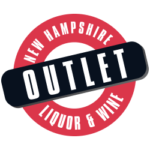 All results powered by the NH Liquor & Wine Outlet will be displayed live at the Millennium Running timing trailer adjacent to the finish line. Live online results will be published exclusively on MillenniumRunning.com. Finishers of the event will receive a link to their finisher video. The link will be emailed online 1-2 business days following the event. 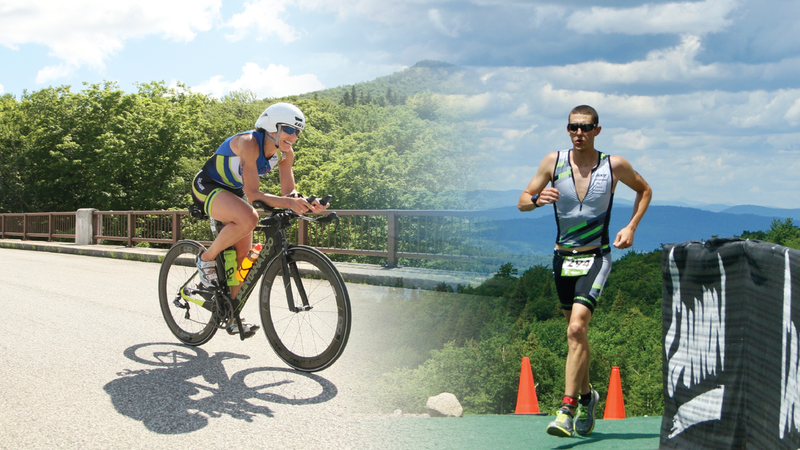 What is the New England Tri Tour? 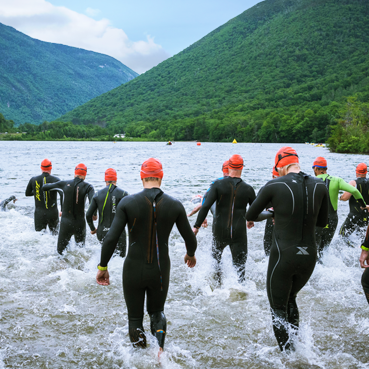 : The White Mountains Triathlon is a proud member of the New England Tri Tour. The NETT is a great regional series with events all over New England. Offering both Sprint and Olympic distance series, make sure to check out our partner events! The Tour features perks for age group winners, completion of multiple events, and completion of events in all NE states. What is the area like? Where can I stay? : Check out our Travel Page for all the info you’ll need to know about the Franconia Notch area! Refund Policy: Please read our Refund & Transfer Policy for full information. 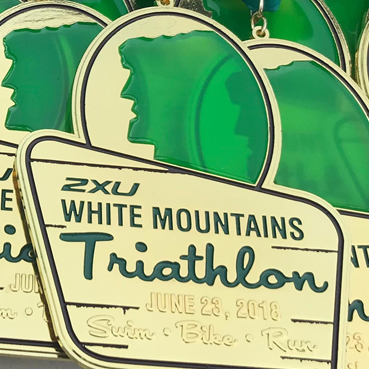 Millennium Running is proud to have The Adaptive Sports Partners of the North Country as the official charity of the White Mountains Triathlon. Each registrant has an opportunity to support Adaptive Sports Partners of the North Country by participating in the optional fundraising platform that is auto-created when you register online. The mission of Adaptive Sports Partners of the North Country is to enrich the quality of life for people with disabilities through year-round sport, recreation, and wellness. They seek to enhance the personal development and self-esteem of participants and provide an opportunity to take risks in a safe and supportive environment. They believe that the opportunity to experience the thrill of accomplishment can be a life-affirming experience. They are committed to including the families and friends of our participants, volunteers, partner organizations, and the North Country community in our efforts. To learn more about this charity click here.